Paleo Bacon Wrapped Prawns | Paleo Christmas Recipes. Yay it’s Christmas time! This year it’s going to be a very merry(maker) affair! We’ve planned a whole series of paleo Christmas recipes, from salads to delicious meats (like paleo bacon wrapped prawns) to sweet treats! Sorry to all our northern hemisphere friends but the recipes will be made for the summer… but you can save these for your paleo Christmas in July! So where is a good place to start? Duh… the starters (or entrees or savoury snacks in merrymaker language)! Anyone for some paleo bacon wrapped prawns? Don’t mind if we do! Our paleo Christmas starters will include lots of recipes already on the site. Like our crackers with beetroot + mint dip (this recipe is in the eBook! ), zucchini bites, spiced nuts + meatballs. 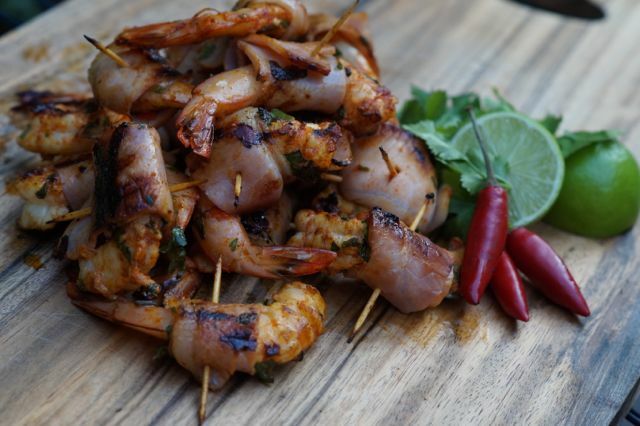 One thing is definitely missing from this summer paleo Chrismas starter menu… the prawns! What makes prawns even better? #BACON! Are you in yet? Well before you drown in your own drool, here’s the recipe! Go on, add them to your Christmas starter menu! We’re sure they’ll be a hit! In a bowl combine the macadamia oil, coriander, paprika, chilli + garlic to make the marinade. Add the prawns to the marinade + coat well, place in refrigerator for at least 2 hours. Wrap each individual prawn tightly with the halved bacon + secure with the tooth picks (or place four prawns on one skewer). Cook on a hot BBQ, grill or fry pan for about 5 minutes on each side or until the prawns are cooked through + the bacon is deliciously crispy. Place the prawns on a large platter + serve with lime wedges.